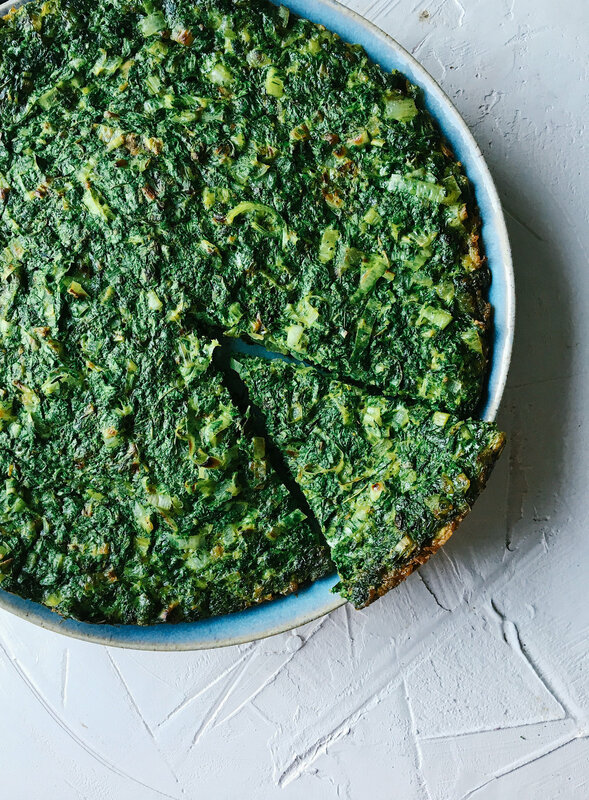 Persian Herb & Leek Frittata. October is here and I thought I'd share a few recipes that I've been cooking on repeat lately. The weather has finally cooled off and our oven is back in action. I'm roasting all sorts of vegetables that I pick up at the Copley Farmers Market. All of my favorite squash are back in season and not a week goes by that we aren't roasting some cauliflower too. I hope to share a few of my own recipes here soon but for now, here are some links to recipes that we've been loving. This Persian Herb and Leek Frittata has been on repeat in our kitchen since the spring issue of Bon Appetit came out. It’s jam packed with fresh herbs and so deeply satisfying. If you have trouble finding dried fenugreek, we recommend looking at an Indian grocery store or market. We found ours in Cambridge on Mass Ave. You'll need to do quite a bit of chopping, so sharpen your chefs knife. I love that this frittata is dairy-free too. This Slow Cooker Butter Chicken from the NY Times was a recommendation from my friend Christine Chitnis. She makes it on the regular and says that her boys love it. We made it when having a family over for dinner (they have 3 boys) and it was a hit. You might want to add some heat if you’re into that. Adam doused his serving in hot sauce.🤣 I will probably add some aleppo/maras pepper to the recipe next time as it's a bit flat on its own. Julia Turshen’s Roasted Radishes with Kalamata Vinaigrette. If you love kalamata olives the way that I do, you’re gonna love this vinaigrette. This is another recipe that has been gracing our kitchen a lot since I got the Small Victories cookbook last spring. Roasted radishes transform into sweet little things and the kalamata dressing just elevates the whole dish. Briny, salty and delicious. My friend, Ayse, blogged about this Tomatillo and Chicken Soup right when I had a fridge full of tomatillos begging to be cooked. I love it when that happens! Also, we recently bought a crockpot (about 20 years late to the party) so I’m into everything that is easy and crockpot friendly right now. Adam loves this soup because it’s got some heat! I added the jalapeno seeds which lends a good amount of heat. If you don’t like spicy foods, I recommend leaving them out. So. easy. Big news this week: I'm doing my second Whole30! 🙃 Starting January 2nd I said goodbye to eating sugar, dairy, grains, legumes, soy, alcohol, and probably some other fun things that I can't think of right now. So, I'll be in the kitchen pretty much 24/7 this month and I decided to share some of what I'll be cooking during my Whole30. Not to worry, this foodie needs lots and lots of flavor to get through this month without butter and chocolate, so I promise that all of you non-Whole 30'ers will enjoy these recipes too. First up, shakshuka. Because rarely a day goes by that I don't eat eggs for breakfast. This recipe comes from the new Soframiz: Vibrant Middle Eastern Recipes from Sofra Bakery & Cafe cookbook and I can't recommend it enough. I had the pleasure of working with Chef Ana Sortun for a year and learned so much from her about the power of cooking with spice. I love this recipe because it comes together quickly, you can make the sauce the night before and bake the eggs the next morning, and it's relatively inexpensive to make. When we lived in Belmont we ate at Sofra weekly, sometimes twice a week. Now that we're on the other side of the river we rarely make it to the bakery, but I'm happy that we can recreate some of our favorites at home with the cookbook. This dish is one of the most popular breakfast dishes at Sofra and it's Whole30 compliant so it's a win all around! You can find the complete recipe here. Don't skip the green sauce called zhoug. It's a little spicy but so, so flavorful. We basically want to eat it by the spoonful. Happy 2017! Did you guys have a good New Years? Let me know if you makes this and love it!